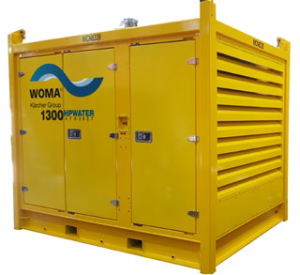 WOMA (Australia) Pty Ltd has released to the market an imposing new range of robust, safe and reliable fabric maintenance solutions for the Offshore Oil and Gas Industry. Utilising WOMA and Dietmar Kaiser Pump systems, Caterpillar and Cummins Power Packs and fully protected by Miretti Explosion Protection systems, these units provide a range of advanced High and Ultra High Pressure, Vacuum, Hydraulic, Air Compression and Subsea pumping systems for the Offshore Oil and Gas Industry. Their progressive and forward-thinking bespoke engineering capacity has additionally enabled the development of associated manipulators and robotics as required by clients and situations from time to time. The exacting Occupation Health and Safety, Quality and Production benchmarks required by the Subsea, Topside and Refining facilities means that the WOMA team has worked hard to successfully meet these demands with outstanding solutions that are effective and totally uncompromising in their improved excellence. 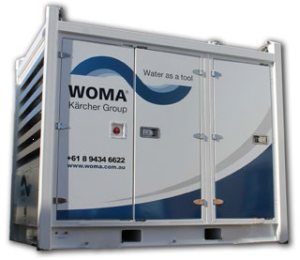 WOMA has developed a dynamic high pressure water capability enabling work at sub-surface depths of up to 3000 metres. Powered by the ROV’s on board hydraulic flow, the unit is self-priming, using sea water to blast marine growth and other fouling from sub-sea structures for inspection and maintenance purposes. The water flow is optionally ‘fixed’ or attached to the ROV manipulator arm for more precise cleaning. Being a relatively inexpensive investment, operators can opt to hold immediate supply of replacement parts or pumps to ensure unimpeded subsea operations. 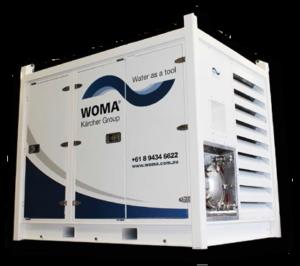 WOMA’s strategic alliance with arguably Europe’s most progressive Vacuum pump manufacturer Dietmar Kaiser AG, has enabled WOMA to develop the Zone 2 Group IIA T3 Offshore WOMVAC 2000. Fully ATEX compliant and in an offshore certified lifting frame, this unit is powered by a CAT C 4.4 or Cummins 6BTA5.9-C engine, Miretti protected and capable of 24 inHg at 1800rpm. Being fully air controlled, and having one Seal Water and Separator tank, the unit boasts the flexibility of either independent use on two concurrent jobs or alternatively, stronger combined use on one single job. Inbuilt into the unit is also a certified collector vessel interceptor) with a volume of 1.2m3 which enables the collection of ‘over carry debris’ and particles in suspension as well as providing protection for the pump. The Vacuum Pump also has the ability to reverse pressure during operation acting as a positive blower up to 0.5 Bar, for removal of hose blockages and rapid evacuation of the debris vessel. Built to WOMA’s exacting standards, this unit is robust, simple to operate and maintain and we believe will strike a new benchmark in reliable Hazardous Zone vacuum operation. Alternatives are available in both hazardous & non-hazardous design. D7C TA, 6 cylinder, 4 stroke, in-line, 7.15L diesel engine producing 158kW with a 270cc Hydraulic Pump producing 420l/m at 195Bar and a Pressure of 350Bar at 250L/Min. With ATEX compliant pneumatic starting system and Remote electrical shutdown via certified panels with pad lockable bypass valve for powerless operation it offers safety and compliance. The Unit comes standard in a Lifting frame and slings to AS EN 12079 with High exhaust gas temperature, Engine over-speed, Engine coolant, High temperature, Engine oil low pressure, Hydraulic oil level low and Hydraulic oil high temperature shutdowns. A final touch includes the option of ‘silent pack’ enclosure system with corrosion & moisture proof soundproof acoustic panels. Diligent and innovative engineering a design has created a unit that is 3400 x 2300 x 2875mm in dimension and weighs in under 7 tonne. With 20 years of offshore Ultra High Pressure, High Pressure, Jetting, Intervention and Down Hole Injection experience WOMA has now refined its Hazardous Zone 1 and Zone 2 pumping units to ensure that its clients are both IECex and/or ATEX compliant where required. 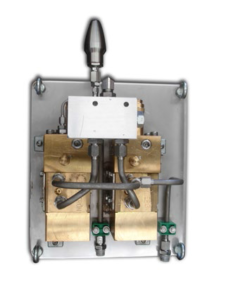 These units offer unsurpassed simplicity of operation, safety and reliability. Together with WOMA’s highly trained Technical Service Support personnel, WOMA guarantees that its clients are impeccably supported in the field. 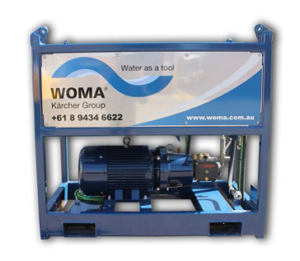 For all enquiries and quotations, the WOMA team can be contacted on hpwater@woma.com.au or +61 8 9434 6622. Cognisant of the current and difficult operating conditions the WOMA team looks forward to partnering in your success.